On a bright and blustery day last month, a surreal event took place in the world of German energy prices. Sunny and windy weather lit up the country's solar and wind farms, causing a surge of clean energy that amounted to almost all of Germany’s 45.8 gigawatt daily demand. Topped up by the supply from traditional power plants, the sum of energy being produced that day was well in excess of the amount needed. And that means that for a brief moment in time, energy prices were negative: consumers were effectively being paid to use energy. The below chart shows Germany's power production and consumption on 8 May 2016: you can see the gigawatts peaking between 10am and 12am. Germany isn’t the only country living the green dream: for four consecutive days last month, Portugal managed to run entirely on wind, solar and hydro power. It’s a bright point in a generally cheery picture for Portugal, with renewable sources now providing almost half its energy each year. 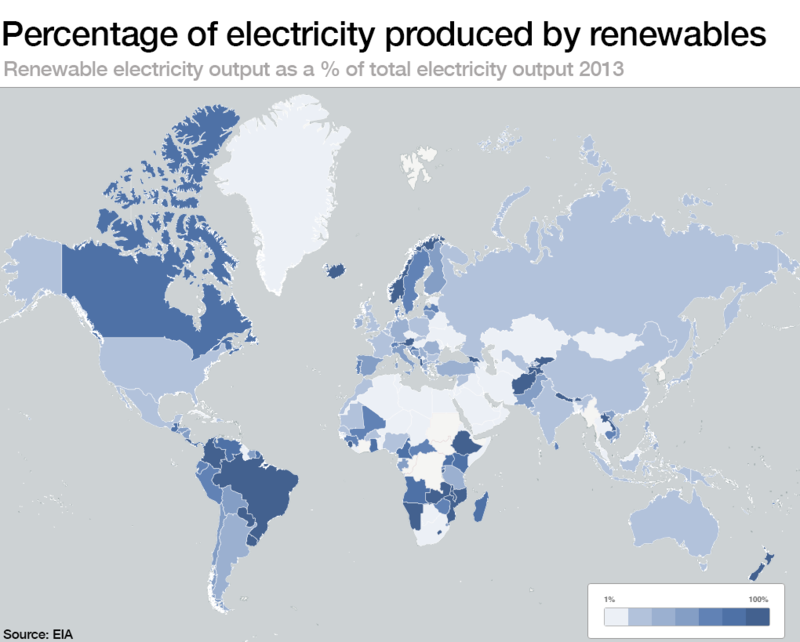 Sixteen countries have now hit 100% renewable electricity production, according to 2013 data from the Energy Information Administration . Costa Rica made headlines recently by running entirely on clean energy for 75 days of 2015. Iceland has achieved its target of becoming 100% renewable-powered, with Norway close behind on 98%, according to the data. And it's a bright (and hopefully windy) outlook for sustainable energy the world over. The alternative energy sector has grown more in 2016 than in any other year since records began, according to the recently released Renewables 2016 Global Status Report , which also notes that by the end of 2015, renewable capacity was “enough to supply an estimated 23.7% of global electricity". To find out more about sustainable energy and the countries leading the way, read on: 6 countries leading the charge towards renewable energy Renewable energy is not enough: it needs to be sustainable Where can renewable energy be stored?